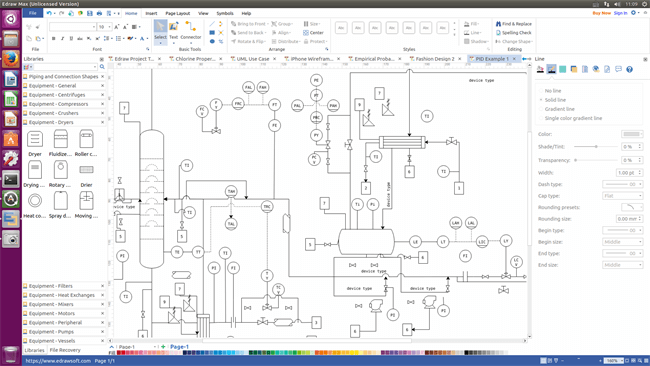 Edraw is a state of the art electrical plan software for Linux which is professional in creating various electrical plans. Edraw electrical plan software is an all-inclusive electrical plan creator for Linux which covers floor plan, home plan, office layout, electrical and telecom plan, seating plan, security and access plan, etc. 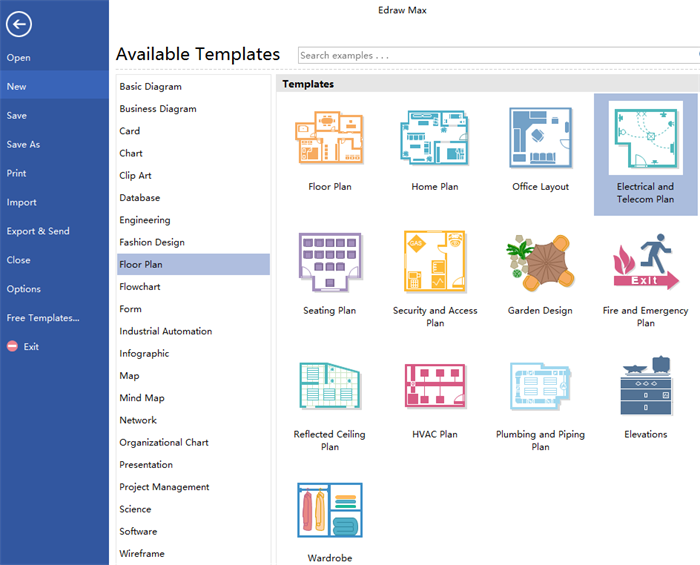 It helps people with or no drawing skills create professional plans within minutes by providing various built-in electrical symbols and templates. 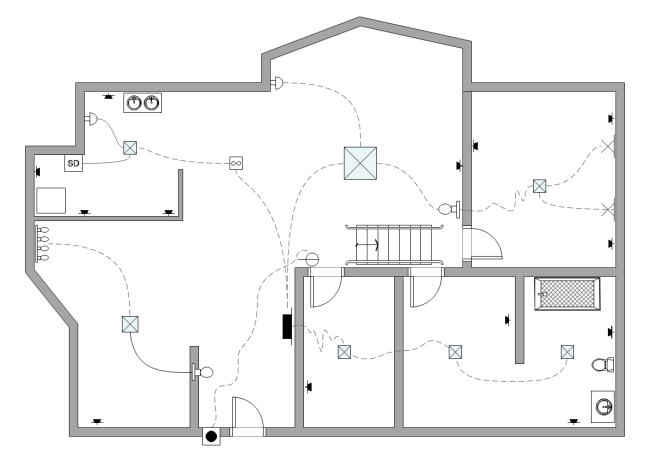 This all-in-one electrical plan software for Linux is able to create more than 13 types of floor plan, except for electrical plans. It provides a large quantity of standard symbols for users to drag, drop and edit, which simplifies the drawing process a lot. Numerous well-designed electrical templates and examples are offered to help users get started quickly. It supports importing and exporting multiple file formats within clicks, which enables users to share with others more conveniently. Its professional functions enable users to design preciser and graphical electrical plans. 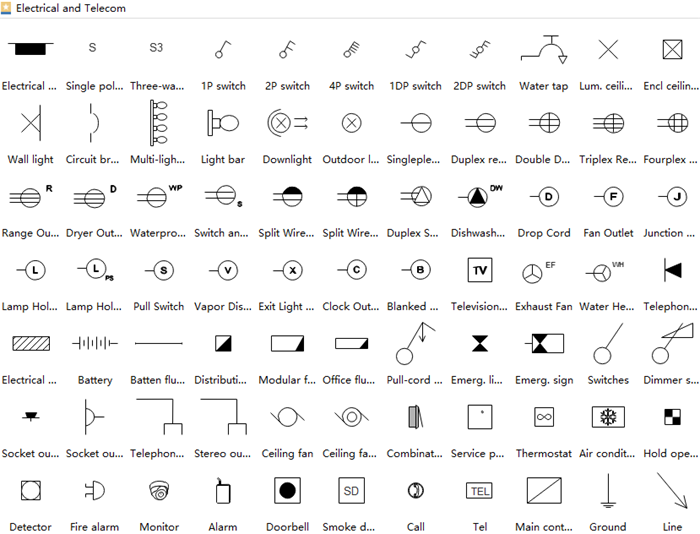 Users can find thousands of electrical symbols in the left libraries grouped into different categories. Below pictures shows only the tip of iceberg. All the symbols are free to drag, drop and edit. Users can customize the colors, dimensions and directions according to the requirements of different situations. Edraw also provides a set of drawing tool for users who need to design new symbols and it never stops creating more elements, too. Step 1. Open a Blank Drawing Page. Run the software, go to File menu > New, then click Floor Plan and double click Electrical and Telecom Plan to open a new drawing page. Go to Floor Plan menu and set the drawing scale on the basis of specific need in the first option button. 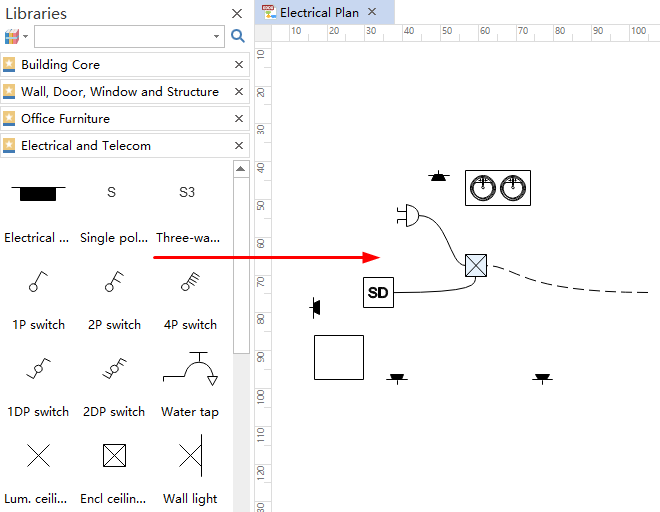 Drag relevant electrical symbols from the left libraries and drop on the drawing page. 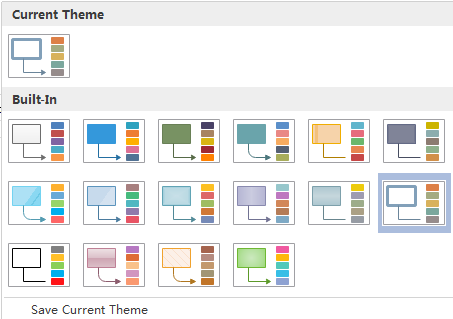 Navigate to Page Layout and change the theme from built-in themes if you are not satisfied with the current one. Click Save on File tab to save the electrical plan as the default format .eddx. Choose Save as on File tab to save it as other formats. You can choose to save in local files or save in your Cloud. 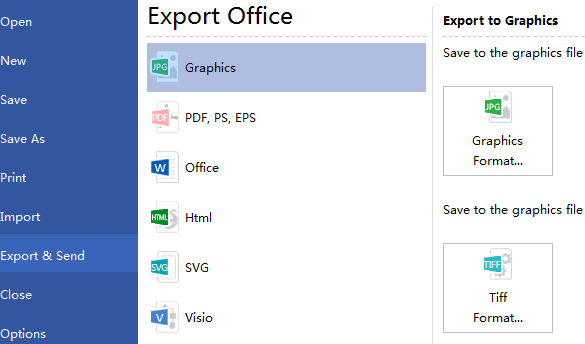 Hit Export & Send under File to export the plan as Word, Excel, PPT, PDF and some other common formats that convenient to share. 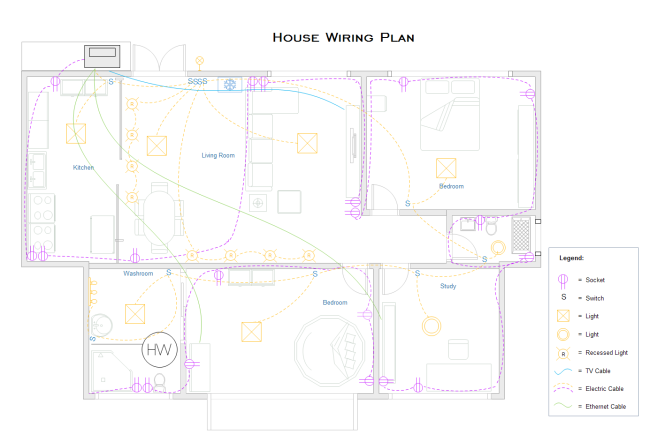 This is one of most commonly used house electrical plan which has been applied in many houses, users can download and customize the details to make it your own plan quickly. When planning your home wiring project you should make a clear and accurate wiring plan to instruct work, and this home wiring plan suits you perfectly, just download and edit it to your own! 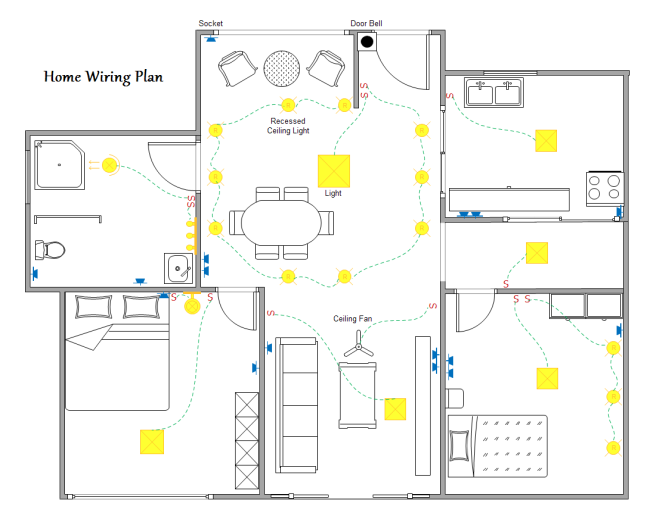 Here is a house wiring plan example which shows the switch, light and outlet locations and how they are wired clearly.